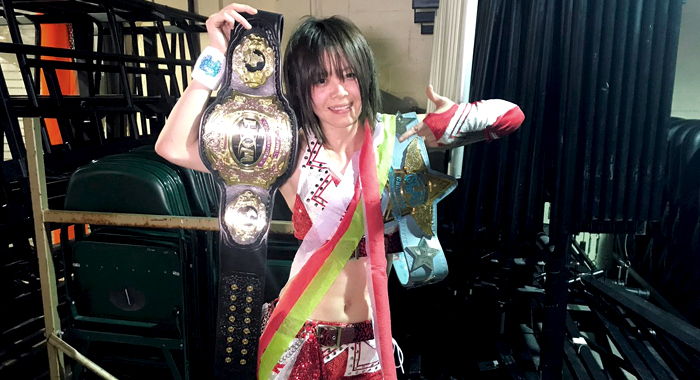 25-year-old Japanese sensation Mayu Iwatani, considered one of the top female wrestlers in the world today, has returned to the United States to conquer the Ring of Honor women’s division. At Sunday night’s ROH Bound By Honor event in Florida, the STARDOM ace defeated Kelly Klein in an excellent bout to become the new Women of Honor World Champion, less than two months before the promotion is set to run their biggest event ever at the world’s most famous arena, Madison Square Garden. While she may be considered “young” by many people’s standards, Iwatani has already been wrestling for 8 years and was a part of STARDOM’s very first class of trainees. Her list of accolades includes ten different championship reigns across virtually every division in STARDOM including the World of Stardom Championship (their top world title) and their secondary Wonder of Stardom Championship, as well as tag team and trios titles victories alongside top names like Io Shirai, Kairi Sane and Hiroyo Matsumoto.